Since August 2013 I have been studying at the London School of Puppetry, working towards receiving my Diploma of Professional Puppetry. In late January I had the opportunity to spend an intensive week at the school undertaking their illustrious marionette carving course. So much to be learned, this was potentially the hardest and most satisfying week I have spent at LSP thus far. Never having worked with wood before and not having a fantastic knack for the mechanical, this week presented significant challenges for me, all of which I was eager to master. The head of the school Caroline Astell-Burt commented that I was in quite an interesting position as far as my experience; most students coming in to the carving course, have little to no experience operating marionettes, and learn these skills using their own puppet. I however, due to an injury in 2013 have tackled the Diploma back to front and so have had quite a lot of experience operating. I personally was very grateful for this as I feel it gave me a greater insight in how my marionette would function and how I might like her to move. Caroline will also tell you just how excited and impatient I was to build my own marionette... this was something I had been looking forward to for quite some time. Through my planning prior to the course, coupled with my experience and taste, I came to the conclusion that I would like my puppet to be quite simple; proportionate and sleek. I find that marionettes have such an amazing ability to express themselves through movement that often heavy characteristics (painting, costumes etc.) is unnecessary. In my experience working with marionettes and watching other marionettist's perform I have always found the simpler puppets to be much more effective. That is not to say that I don't enjoy the heavily painted, they certainly have their place, but for me this was the right direction. Given that I am still learning, I really wanted to challenge myself and focus heavily on my marionettes movement. I decided early on I would like to try to make my marionette swim/fly, something that would take some figuring out and a few trick strings. 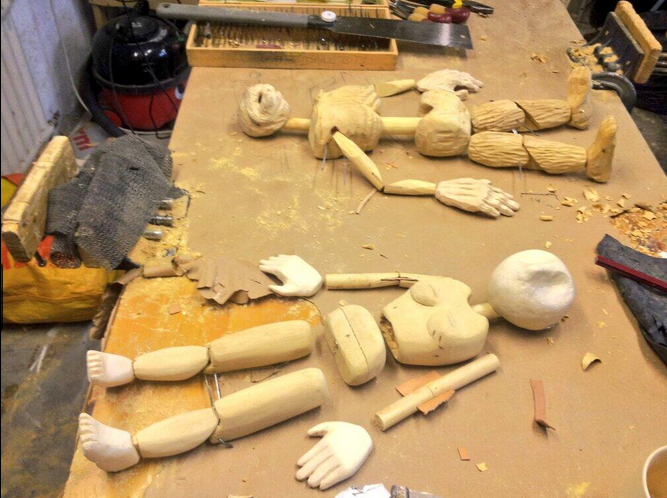 The work involved in creating a marionette is very physical and time consuming. When undertaking the course you understand why the LSP has structured it as they have. 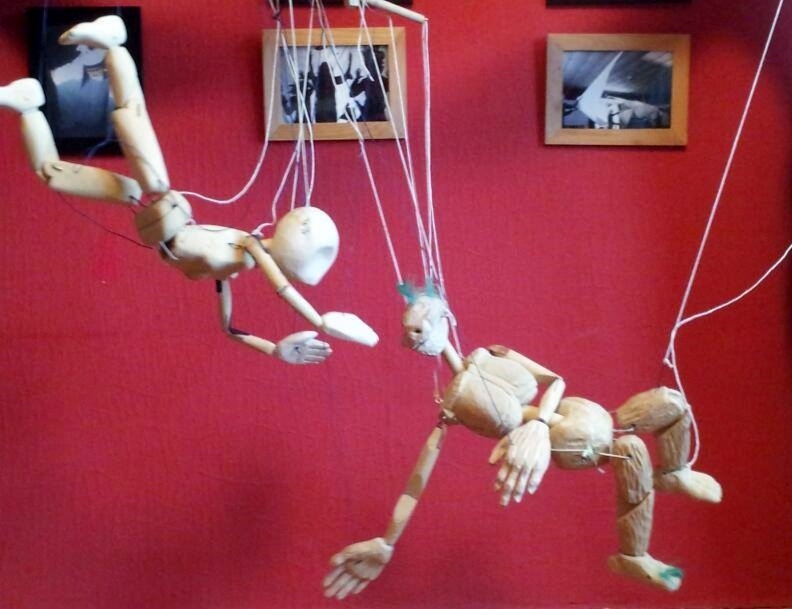 It takes absolute focus and dedication to get a marionette finished in a week and working together while living at the school, with their fantastic workshop at your disposal, you really have the opportunity t immerse yourself completely in the task. We would work from nine in the morning till around ten or eleven in the evening. Our entire existence was wrapped up in our marionettes. Now, having come away from it, it actually feels quite surreal. It was a wonderful time, their was a real sense of camaraderie in the workshop. Where Caroline usually has four or five pupils on the carving course, we were absolutely blessed to be a very intimate group of two. My comrade was Hillary Kneale, a performance artist from Oxford who kept me very entertained through the process. Our puppets were about as different as they could possibly be; Hillary took a more absurdest approach creating an absolutely amazing creature, disproportionate and rough (pictured above). Through the insecurities and the muscle aches, the trials and the triumphs, we grew together as a team. I feel that the experience of creating a marionette is so special, especially your first, and I honestly couldn't have asked for a better companion. For examples of Hillary's work visit: www.hillarykneale.com. Also staying at the school during this week was Spanish performer and researcher Ana Lorite. Ana had carved a marionette at LSP the previous year and had returned to utilize the school's library for her research into puppetry and education. I had met Ana at the Skipton Festival in 2013 where her and her partner performed under their company name "Naranjarte". An absolutely amazing duo, mixing puppetry, acrobatics and circus arts, you can see examples of their work here: http://naranjarte.com. 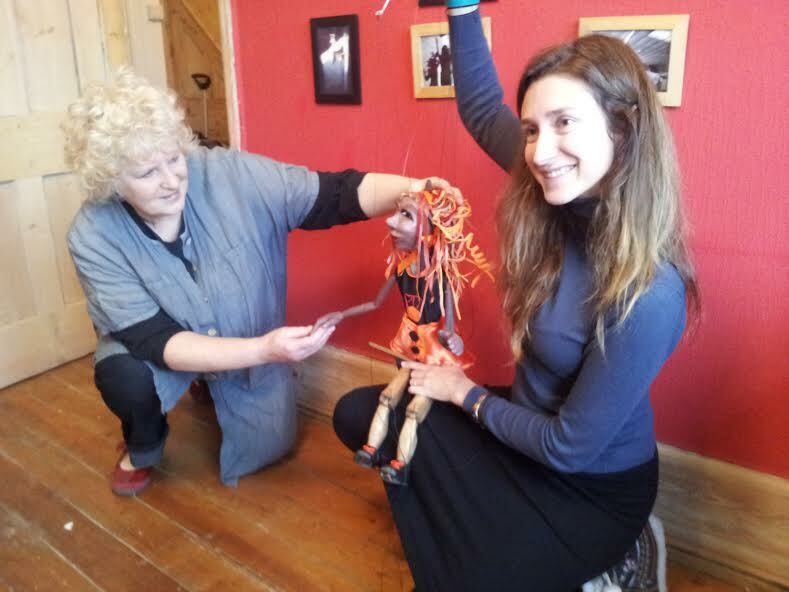 Given that she had already completed the carving course and had brought her lovely marionette "Nitunga" with her, not to mention her vibrant, lovely personality... it was a joy to share this week with Ana and have her there with us as our marionettes came to life. The final day on the carving course was the most stressful; the feeling of anxiety as the thought swirls around your mind "Will I be able to finish in time?". Caroline told us that no-one had ever walked away from the carving course without a finished, functional marionette... but nevertheless the fear that I might be the first refused to leave my mind for most of this final day. At around ten in the evening the time had finally come... we started stringing my marionette, connecting her to the controls. I couldn't wait, the anticipation was too much. Finally I held the control in my hand, my little marionette hanging off her strings. Pure joy as I brought her to life. Though there is certainly room for improvement, she moves beautifully and with the help of Ronnie Le Drew, Caroline and I were able to figure out the trick strings needed to make her swim. And when she does, it is so incredible! That first moment when your marionette comes to life is incredibly special. I am so happy with how she came together and very proud. I am excited to continue working with her, practicing my technique and developing her movement. She will be the star of my solo performance piece, the main assessment for my marionette module. Though absolutely exhausting, this week spent in the workshop at LSP was fantastic. I feel very privileged to have had this experience and to have shared it with such amazing women. More photo's can be seen in my Gallery.